There are flux calculations on observed atmospheres, resulting values for Su, Aa, St, Eu, Ed and G.
You assume that the global average tau (changing arbitrarily by the GHG’s) determine Bg. This assumption contradicts to the empirical fact described in Eq. (2) which fixes Su = 3OLR/2 and maximizes g at 1/3. 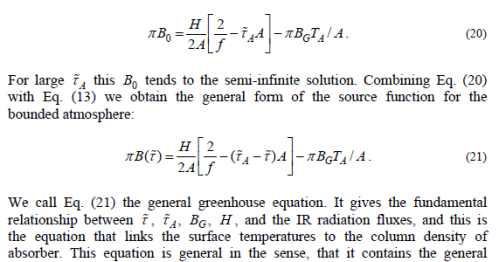 According to these equations, it is OLR and the IR structure together that determine Su, and controls the amount and distribution of GHG’s to set tau. That tau equals to the actual and the time-series average. Thanks for noticing the sign error and other typos; they were corrected three years ago. This bit of snark is unjustified. The corrections may have been made somewhere, but not in the freely available copy in the link below. That’s where the corrections need to be made because that’s where anyone interested in the paper is going to look. This article reviews the theory as outlined in M2007. Do you have anything to contribute to the discussion of theory? Let’s move away from Miskolczi’s theory and discuss a random theory to find out what you think about the role of theory in general. Let’s say I seem to find that my lawn grows more when the moon is full. And less when the moon is new. It’s an exciting discovery. I produce those results with some nice graphs. Now I develop a theory that “explains” these results with an equation, G = k.M1.6, where G is the rate of growing, in mm/day, k is a constant and M is the phase of the moon as a fraction. I take the standard equation for grass growing from the theory as shown in, Journal of Biology January 1951, and substitute one of the parameters in the standard theory to another arbitrary parameter that I found in a different equation, developed for different conditions, in Journal of Grass Growing, March 1972. As a result, I produce a new equation, never before seen, then differentiate it with respect to the time of day, holding the total energy constant (without comment) to produce an equation that backs up my experimental results. My question to you – if I can produce a theory by this mechanism to apparently support my experimental results, have I provided support for my experimental results – or not? And if I further explain – upon being questioned by interested grass growers – that the new equations were really derived from my experimental results, have I provided theoretical support for my experimental results – or not? Your answers will guide me in my next question. You claim that the theory independently supports the experiment but you invented the theory based on the experimental results and claimed it as theory. This is NOT an independent line of support and actually seems like —–! What do you think about the hypothetical grass grower and his theory? I of course generally agree with you about he paper. On the specific issue of B0 and differentiating Eq 7, I understood that while B0 is constant over the range of τ for a given atmosphere, FM is differentiating with respect to τ_A – the total optical depth of possible different atmospheres. Please give an example of a different atmosphere where πBo≠H/2. Even if his equation had been correct, πBo max will always occur at the original τ_A, as I pointed out in the comments in part 4 of this series. Not to mention (again) that Su ≠ πBg. Su + K = πBg because πBg is the radiative flux for a non-convective atmosphere. 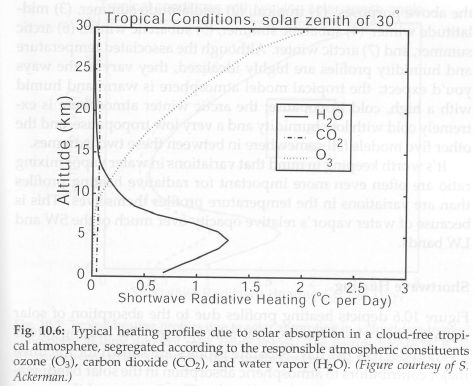 Figure 6 is the radiative temperature, not the atmospheric temperature. Look at the layer by layer absorption and emission. If we break the atmosphere into 100 layers, the optical depth of each layer is 0.03 making the emissivity equal 0.029554. This is the temperature discontinuity that will always be seen when inserting an arbitrary surface into the simple semi-gray atmosphere model. The surface has to have an effective temperature high enough to equal the effective temperature all the layers below if the surface weren’t present. I have followed the authors output over the last few years and find bits of what he says plausible and other parts totally incomprehensible. There also seem to be some parts missing. His first language is not English and did he say in another forum that his knowledge of computers/spreadsheets was limited? All in all it is a shame that he doesn’t find a suitable co author whose first language is Engish, is able to mathematically interpret what he says, argue with him when necessary and attempt to produce a coherent theory of a standard that could be presented for peer review. Wheher it would actually pass peer review is quite another matter of course. I understood the same point. After all he is differentiating the equation with respect to τA to find out what relationships exist. However, when you derive the SGM equation the integration constant is always F0, and has no dependence on τA. The value that does change in the SGM model with τA is BG – the source function for the ground. As τA increases the surface temperature increases. The thing is, FM has rejected this condition (in 15). He sets out his argument at the start of Sec 4.2. He notes that Eq 15 leads to a discontinuity at the bottom. Instead of the Eq 15 condition at the top, he uses his energy balance criterion, and takes BG as data (not depending on τ_A). Then there is a non-trivial dependence of B0 on τ_A. I think he’s wrong. You can’t have a discrepancy at TOA, because there all heat transfer is radiative. You can in the lower troposphere, because there is convection (and clouds). So Eq 15 is the only solution that makes sense, and it applies from TOA down until the underlying equation (constant H) fails. But his assumption is the basis for the algebra he does in Appendix B.
I understand and agree with your points. What I am saying is the fact that Miskolczi believes B0 is a variable does not make it so. He actually needs to prove it. Especially when he has used the formula which proves it is a constant. semi-infinite integration domain over the optical depth in the formal solution is widely used. For finite or optically thin atmosphere Eq. (15) is not valid. In other words, this equation does not contain the necessary boundary condition parameters for the finite atmosphere problem..
..Eq. 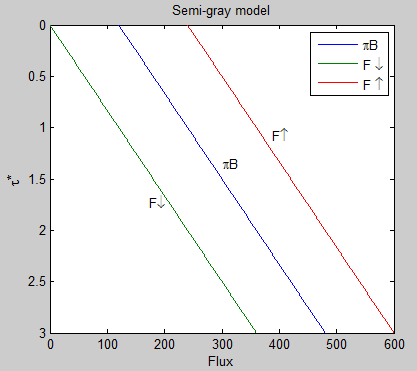 (15) assumes that at the lower boundary the total flux optical depth is infinite. Therefore, in cases, where a significant amount of surface transmitted radiative flux is present in the OLR , Eqs. (16) and (17) are inherently incorrect. This is not true as already demonstrated. ..The complete solution of Eq. (12) requires only one boundary condition. To evaluate B0 we can use either the top of the atmosphere or the surface boundary conditions since both of them are defined. This is not true. 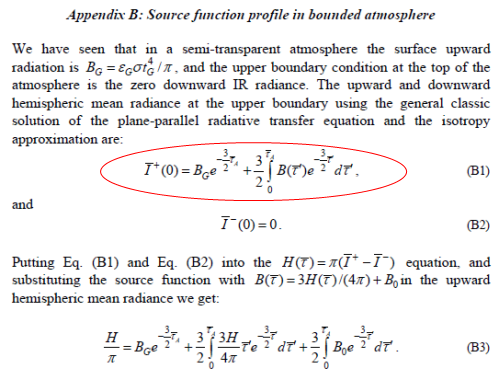 The surface boundary condition is not defined. Not in this theory (the idealized semi-gray non-convective model). And if “extension” of the theory results in a known boundary condition being violated – F↑ (OLR) ≠ F0 (absorbed solar), it demonstrates the “extended” theory wrong (as you point out in your comment). And he doesn’t actually re-derive the equation. Instead he substitutes values from the existing derivation into the general equation of radiative transfer and just claims that (somewhere along the line) B0 has now become a variable. 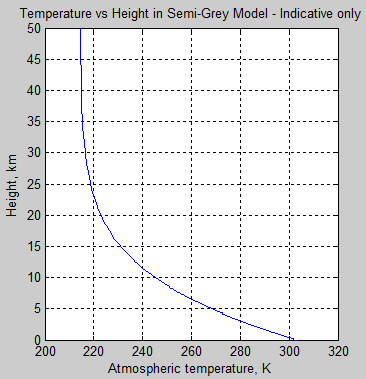 The semi-gray model is just a very simple model, not particularly useful for our atmosphere. Even if it could be re-derived to fit Miskolczi’s claims this still wouldn’t get anyone anywhere. And it still can’t be substituted into the general equation of radiative transfer. And BG is still a variable, not a constant. Nick, I’m sure we both agree – Miskolczi has assumed / claimed / imagined that B0 is variable. But that doesn’t make it so. Here is the derivation of the SGM, referencing figure 2 in the article and the general Schwarzschild equation: dI/dτ=B-I. (The reason for the sign difference is direction of F↑ and F↓). And the longwave fluxes, F↑, F↓ and B are functions of τ (i.e. they change with height in the atmosphere), but this is not written explicitly to make the equations easier to follow. Net flux is a constant, by definition of radiative equilibrium there is zero heating of every layer. (For newcomers, why is it not zero? Because flux can pass through the atmosphere without interacting with it. But net reduction in upward flux has to be balanced by an increase in downward flux, otherwise energy is added to a layer). At τ=0, F↓=0, and F↑ = F0, absorbed solar radiation. ⇒ F↑ – F↓ = F0 …. ⇒F↑ + F↓ = 2πB …. But when tau; = 0, F↓=0, and F↑ = absorbed solar radiation, F0. ⇒ F↑ + F↓ = F0(τ + 1) …. ⇒ B = F0/2π . (τ + 1) …. You can see the graphs for eqns 6, 7a and 7b reproduced in figure 3. As I remember, even moderate resolution band models are too computationally intensive for a GCM. RT is parameterized too. One of the CMIP studies found large discrepancies between more accurate RT models and those used in some of the GCM’s in the fairly recent past. There are still significant discrepancies between the AOGCM radiation codes and LBL codes in the models used for IPCC AR4. WRT Eq 4. At last, an ‘offset C’ that can deal with ‘latency’. IMHO you’ll need at least two of these offsets, one to deal with ‘water vapour to water’ (and inverse) phase changes and one to deal with ‘water to ice’ (and inverse) phase changes (remembering that these phase changes occur closest to a ‘Cp’ definition). However, ice also sublimates. You can’t simply throw convection, either sensible or latent, into a simple gray atmosphere model. I’ve tried and haven’t come close to making it work. I’m pretty sure you need a full bore radiative/convective model with a non-gray atmosphere, at least a band radiative model. I have some sort of 1D R-C model that came with a book on atmosphere modeling. I think it’s just Fortran source code, though. I have the nasty suspicion that convection is so highly parameterized that it amounts to a kludge. However, according to the description in the book, you can start with a warm or cold isothermal atmosphere and have it converge to a temperature profile that looks more or less like the Earth’s atmosphere. This semi-grey model is very simple. It doesn’t include convection. Radiative equilibrium implies that temperatures have reached equilibrium via exchange of radiation only. This isn’t the model that you want to build on. (Or develop a “new greenhouse theory” on). GCM’s are much more comprehensive – although this article isn’t covering that subject. However, GCMs use the general solution described in the article and with band models because the line by line (LBL) solution requires too much computation. These band models are verified against LBL solutions of course. Did I mention convection? No. Exactly the point. However, to look at this in another way. There needs to be a temperature difference within the depth to extinction for a net radiative transfer to occur, no? What if a change of phase is underway within that radiative shell? Temperatures are buffered while the radiative flux soaks ‘into/out of’ latent heat because, loosely speaking, the latency due to phase change alters the energy capacity for the region. Isn’t this so? OK. It seems I’ve time for another post before a reply here. Primarily, I don’t understand how a static model like the SGM can be used to evaluate M’s theory without modification to it. Once LTE is achieved the model is ‘dead’! IOW, any expansions/contractions, changes of phase for H20 and pressure changes have already occurred and the system is ‘torpid’ (unresponsive). However, Earth’s systems never achieve LTE (much to the disbelief of Tom Vonk) and are always changing diurnally, thus, any model that employs LTE as a requirement must be unrepresentative for the purposes of an Earth system. All I’m trying to do here is improve the SGM’s ability to provide an improved representation of Earth’s atmosphere. I can only see this as an arrangement of arrays that record the offset of individual anomalies that present between the natural state and the state of LTE. When you start talking about heats of vaporization and fusion, the implication is that you’re talking about convection, specifically latent heat transfer. The SGM doesn’t have clouds and even if you put in an absorber with a different scale height like water vapor, it’s never saturated, so there are no phase changes above the surface. LTE (local thermal equilibrium) is different from TE (thermal equilibrium). LTE always applies for altitudes below 60 km. It means that collisional energy transfer between molecules dominates with the kinetic energy distribution of the gas molecules following the Boltzmann distribution. TE never happens in the real world or the SGM. The atmosphere would be isothermal if it did and heat wouldn’t be flowing in and out. Not only the KE, but the vibrational and rotational distributions are also thermal, characterized by the same temperature. A consequence of LTE is that temperature measured by any means is the same. 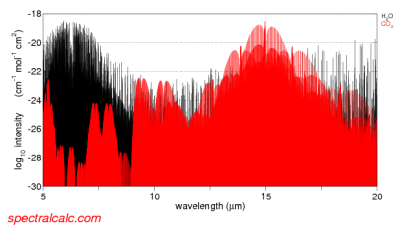 In plasma emission spectroscopy, LTE doesn’t exist, radiative energy loss is quite large, for example, and different methods of measuring temperature give different results. Primarily, I don’t understand how a static model like the SGM can be used to evaluate M’s theory without modification to it. Miskolczi’s theory is built on it. So evaluating Miskolczi’s theory requires evaluating the SGM. Once LTE is achieved the model is ‘dead’! IOW, any expansions/contractions, changes of phase for H20 and pressure changes have already occurred and the system is ‘torpid’ (unresponsive). However, Earth’s systems never achieve LTE (much to the disbelief of Tom Vonk) and are always changing diurnally, thus, any model that employs LTE as a requirement must be unrepresentative for the purposes of an Earth system. DeWitt Payne has already commented on this. Many people confuse LTE with thermodynamic equilibrium because they sound the same. LTE has a specific and technical meaning and it does not mean that the body in question is in thermal equilibrium. For a more complete explanation take a look at Planck, Stefan-Boltzmann, Kirchhoff and LTE. Thanx guys and sorry, I confused TE with LTE. I should’ve left the post mentioning ‘LTE’ until the next day, but my head is full of stuff that I want to get out and don’t usually get the time to do so. thus, I don’t believe that such a person could be so ‘naive’ as to present an SGM model that isn’t modified in some way that enables the model to simulate a ‘real sky’ and not just a ‘clear sky’. This is why I mentioned (in another thread) that ‘you’ll probably need Ferenc’s notes SoD’. My presence here is not meant to be ‘a pain in the bum’, I want it to be a help. Thus, I ask you to consider the ‘offset C’ in Eq. 4 of SoD’s post of May 15, 2011 at 8:57 pm as an ‘array’ of energy that changes within the boundaries of a parcel, but doesn’t alter the total energy of that parcel. Thus, TE can be maintained for the parcel whilst energy transitions continue to be evolved within it. This would permit a ‘wet atmosphere’ where only a ‘dry atmosphere’ could previously exist. Let’s assume that Miskolczi’s derivation in appendix B is correct. Plug this equation into equation B1 (see above) and integrate from τ=0 to τ_A we should get πI+(0)= H. If I use πBg = H/2(1+τ_A+exp(-τ_A) (B11), H=240 and τ_A =1.8, the result is 188.483, a lot less than 240. Therefore as has been shown elsewhere, the solution is incorrect. 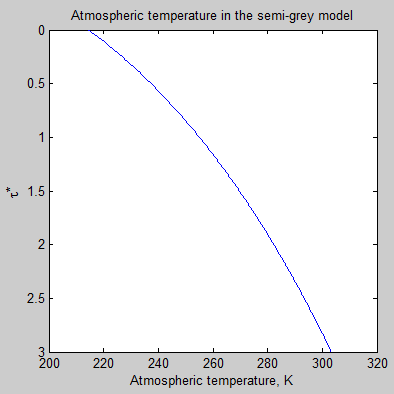 You simply cannot force the temperature of the atmosphere at the surface to equal the surface temperature for the simple gray atmosphere model with a finite τ_A without violating another boundary condition. It’s sometimes hard to tell whether something is a function of something else or is a constant being multiplied, as is also the problem with [M6] that was identified earlier. The end result is still wrong. Thanks, I fixed the equation in the article. (Using τ as τ_flat, and τ* as τ_squiggly). Which is, of course, also the solution for the semi-infinite gray atmosphere. By adding a window and a convective heat transfer term to the gray atmosphere model, I can produce something that looks somewhat like the real atmosphere, at least in the lower part. There’s no significant discontinuity in the temperature vs altitude plot at the surface and the initial lapse rate is ~5.7 K/km. I couldn’t do it with either alone. The window lets me increase τ_A enough to bring the atmosphere up in temperature and the convection term reduces the surface temperature and provides the excess energy for atmospheric emission that isn’t supplied by radiative absorption. This is for an atmosphere that is perfectly transparent to incoming short wave radiation. For my next project, I’ll have to include SW absorption. I think you mean substituting  into . The first eτ of equation  needs the τ shown as superscript. The second term of equation  should be – eτ.BG/(eτ-1)^2. But the point is still that d(Bo)/dτ is always zero, i.e. Bo is a constant. Without a theory that requires a constant optical depth or whatever ratio of fluxes to remain constant, all the messing about with NCEP/NCAR reanalysis numbers is completely meaningless. Those ratios only apply to conditions near present conditions, not to conditions where, say, CO2 is doubled. Ken Gregory, Thanks for the corrections, I have fixed the article. SoD, I think you are right that there is a problem with combining the source function of the semi-gray atmosphere with the general radiative transfer equation. The global average relative humidity at 400 mbars is about 35%. What thermodynamic principle limits it to only 35%? This is much lower than the saturation limit, so that is not the reason. If it is not limited by a property of water (the saturation limit), then it must be limited by an energy restraint. Miskolczi postulates that the amount of water vapour is determined by the requirement of the “maximum entropy principle” such that the optical depth adjusts to maximize the OLR, and Bo for any given surface temperature. He also postulates that the cloud cover is determined by the maximum entropy principle (page 19, M2007). This implies that the atmosphere will maximize the Bo by adjusting water vapour amount for any given Bg. Instead of saying the amount of GHG is what is currently there plus what we add plus feedbacks, we say the amount of GHG is that which maximizes the Bo for each possible surface temperature. This requires calculating dBo/dtau, keeping Bg constant. Therefore, in equation B10, your “correction” in red is not required. One problem is that B0 is a constant which is determined – and required – by the First Law of Thermodynamics. If a solution conflicts with this important law I think we can all agree that the solution is in error? So the fundamental step (assuming that there was a point to developing the source function for the semi-gray atmosphere within the general RTE solution..) would be to demonstrate why B0 varying didn’t violate the first law of thermodynamics. That will be difficult, I think. The conclusion doesn’t follow at all. But the topic is not a simple one. 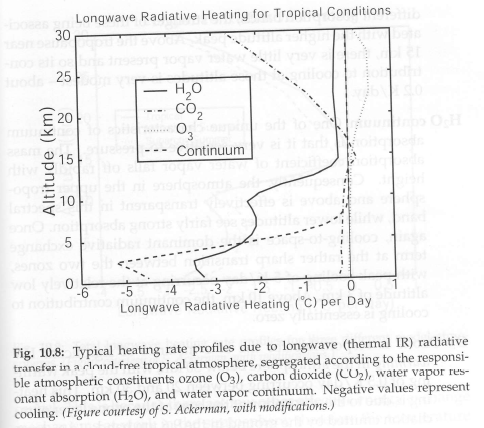 The explanations in Water Vapor Feedback & Global Warming by Held & Soden (2000) are worth considering. (The whole paper should be read by everyone interested in this subject). Convection takes parcels of air upwards – and if this was the only process then the relative humidity (above the boundary layer) would be at 100%. But air rising is balanced by air that is descending. In fact, in the tropics deep convection accounts for ≅ 10% of the area, and subsiding air accounts for ≅ 90%. (The ascending air is moving a lot faster than the descending air so mass balance does occur). The descending air was saturated at its point of coldest ascent. So as it descends its relative humidity drops – and in the sub-tropics this can result in relative humidity less than 10%. Air mixes. So ascending air and descending air produce an average of relative humidity decreasing with height. The observed features can be approximately produced by climate models. You can see an example in the Held & Soden paper. Bo must be a constant because the math requires it. When you integrate a function, say x, the result is the integral of the function plus a constant. C must always be constant because otherwise the derivative of the integral wouldn’t be equal to the original function. Yet Miskolczi in Appendix B of M2007 treats the integration constant Bo as if it were a variable and treats the variable Bg as if it were a constant. You can’t do that and claim your results are correct. It’s the equivalent of saying 2 + 2 = whatever I want it to be at any given time. If you actually do the calculations based on Miskolczi’s equations, the results violate the original boundary conditions. I decided to move to this post as it seemed more appropriate. Usign the typical radiative interchange diagrams like figure 2 above, and extending to multiple layers, I came up with equations for different formulas for tranmissibility. The first is one in which the transmissibility is e^(-ko*dl). I come up with formulas for each layer, and then equations as the limit when the number of layers goes to infinity. I then expanded the analysis for a transmissibility like exp(-ko*rho*dl), where rho changes with P and T. It turned out that by choosing a coordinate in mass all the equations are the same, except an auxiliary equation is needed to get the height. These solutions are close form, exact and contain no approximations, but based on several assumption: transmitability as described, no reflectivity, ideal gas law, constant gravity, semigrey model (clear in shortwave, grey in longwave, a constant emissivity across the spectrum), plane-parallel model, no convection and only looking straight up. 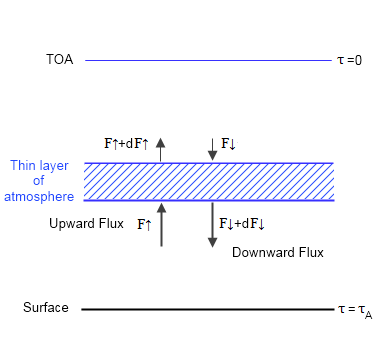 We see that there is a discontinuity from the ground temperature to the bottom air temperature (no convection), that there is a finite top atmosphere temperature, that the mentioned temperatures and the greehouse factor are completely defined by the optical thickness (so tau is equivalent to GH). Also we see that AA is not equal to ED. Now, by having an auxiliary equation for height, it turns out that if the boundary condition for the the last layer is zero pressure, then that layer becomes of infinite height (I would put an arbitrarily small pressure as boundary to avoid that) so I guess this would be an infinite atmosphere, granted with miniscule zero density and pressure at the top. The part I still need to figure out is were the term exp(-tau) in the equation f = 1/2 + tau/2 + exp(-tau) comes from and how does it relate to my model, as it seems to be key in Miskolczi’s derivation, bringing AA ~ ED as well as bringing the bottom atmospheric temperature equal to ground temp. Any information on the difference between his ‘semi-infinite atmosphere’ and his ‘bounded or semi-tranparent’ atmosphere, and physical meening of the extra term will be appreciated it. Ok I know there is a complicated derivation for it, but I did not get my results from any of those formulas, just by the application of transmissibility = exp(-ko* density * delta length) in exact closed form. I would like to see if I can reproduce his equation using my method. It comes from Miskolczi’s incorrect derivation in Appendix B of M2007. If you (properly) treat Bo as a constant and Bg as a variable, you get a different value. It’s all there in the comment thread somewhere. Yes, but how can I argue with results? Figures 21 and 22 of “The greenhouse effect and the spectral decomposition of the clear-sky terrestrial radiation” by Miskolczi and Mlynczak compares the various ways to calculate the ground temp and skin temp, and at first sight, adding the extra exp(-tau) really seems to improve things. That would be no different than adding a term or constant heuristically, and seeing if it improves a correlation, regardless of how it was come about. I just have not been able to reproduce it. In any event, I thought that if I made the ground temperature equal to the bottom atmospheric layer temperature to remove the discrepancy, then I could get closer to that equation. So I added a K term taking energy from the ground and having it completely absorbed in the bottom layer. And I was still able to get an exact result. I still find it hard to believe, but I guess that how the math works out. To my surprise, the ground temperature did not change. It was completely invariant to convection. The bottom air layer temp did change and became equal to the ground temp, and the temp profile changed, but the top layer temp also remained constant. Amazingly this means that you could have an adiabatic rate and the ground temperature would still be correctly estimated from a model in radiative equilibrium with no convection. I used to think that maybe one could find the height of the tropopause first and then work downwards to where the ground temperature would be from the lapse rate, but it looks like its the other way around: The ground temp is defined by the total optical thickness only, and then the temp decreases from that fixed point upwards towards the tropopause. SOD: I’ve meaning to ask you, in your rte program you adjusted the height to equipartition the pressure.. why did you make that choice? did it help in some calculation?. I just realized that dP = -rho*g*dz is dP=-dm/Area*g or basically you equipartion the mass just as I did.. just curious. Argh.. No wonder it did not make sense, I was wrong. Convection from the ground will change the ground temp. What happened was that my convection went only into the first layer to match the temps, then as the first layer got smaller and smaller the convection got smaller and smaller until it was zero and had no effect. I think I know how to fix it. Trying it the other way, by setting K so that AA=ED brought the temperatures at the ground into near equality. So I think I’m onto something here. In any event, posting like this and having to correct my self at every turn is turning into a novel. I will try to prepare a draft of a paper of the semi-grey model I am developing and post it into a site, that way I can make revisions to it as it gets tested and validated. It just takes time and a lot of work. Hopefully something useful will come of this.